The Federal Highway Administration (FHWA) organized 26 States to participate in the FHWA Low-Cost Safety Improvements Pooled Fund Study to evaluate low-cost safety strategies as part of its strategic highway safety plan support effort. The purpose of the study is to evaluate the safety effectiveness of several low-cost safety improvement strategies through scientifically rigorous crash-based studies. STOP signs with higher retroreflectivity strategy was one of the strategies evaluated for this study. This strategy is intended to reduce the frequency of crashes related to driver unawareness of stop control at unsignalized intersections. The safety effectiveness of this strategy had not been thoroughly documented previously; therefore, this study is an attempt to provide an evaluation through scientifically rigorous procedures. Driver compliance with intersection traffic control devices is vital to intersection safety. At stop-controlled intersections, drivers on the stop-controlled approach must identify and observe the STOP sign to be able to comply with the message. Therefore, the STOP sign must be visible and conspicuous. This is particularly important during nighttime or other reduced visibility conditions, such as rainy weather. One method to increase both the visibility and conspicuity of STOP signs is to use higher retroreflectivity sheeting. Retroreflectivity is the property of a material that reflects a large portion of the light directly back to the source through a wide range of angles of incidence of illumination. When applied to a sign, retroreflective sheeting redirects light from the driver's headlights back toward the headlights, which are in close proximity to the driver's eyes. The amount of light from an object reaching the driver's eyes will have a great impact on the ability of the driver to see that object. 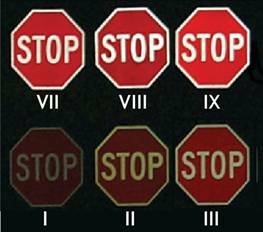 Figure 1 provides a relative visual comparison of STOP signs with six grades of retroreflective sheeting. The States of Connecticut and South Carolina have installed a large number of STOP signs with increased retroreflectivity as a proactive, systemwide effort (i.e., they were installed at all of the unsignalized intersections within the jurisdiction) to improve safety. Detailed data were collected for the intersections in South Carolina and Connecticut where the STOP signs were installed for the periods before and after the installation of STOP signs with higher retroreflectivity. In addition to the locations and dates of the STOP sign installations, geometric, traffic, and crash data were obtained at unsignalized intersections for 231 sites in Connecticut and 108 sites in South Carolina. The analysis included a total of 3,323.8 intersection-years of data (2,038.6 intersection-years from CT and 1,285.2 intersection-years from SC). Intersection-years are the number of intersections where the strategy was applied multiplied by the number of years the strategy was in place at each intersection. For example, if a strategy was applied at 9 intersections and has been in place for 3 years at all nine intersections, this is 27 intersection-years. It was not possible to identify those STOP signs that had poor retroreflectivity before the installation of the new signs. The exact condition of each of the signs, including the age or degree of deterioration of the signs, was unknown. Empirical Bayes (EB) methods were incorporated in a before-after analysis to determine the safety effectiveness of increasing the sign retroreflectivity. The EB methodology for observational before-after studies(2) was used for the evaluation. Safety performance functions (SPFs) were developed for use in the EB methodology. Generalized linear modeling was used to estimate model coefficients using the software package Statistical Analysis Software® (SAS®) and assuming a negative binomial error distribution which is consistent with the state of research in developing these models. Based on the data, two sets of results were calculated and are presented in the following sections. One set contains aggregate results for each State and for the two combined; the other set is based on a disaggregate analysis that attempts to discern factors that that may be most favorable to increasing STOP sign retroreflectivity. The aggregate results are shown in table 1. The results that are statistically significant at the 95-percent confidence level are shown in bold. Note that a negative sign indicates an increase in crashes. Only one statistically significant difference was found—rear-end crashes, both day and night combined, were reduced by 17.5 percent in South Carolina. Nighttime crashes were the primary target of this measure. There was a small reduction in nighttime crashes in Connecticut and a small increase in South Carolina. However, both of these results are statistically insignificant. There were very few nighttime crashes, making it difficult to identify a sufficient sample of sites that had crashes related to low retroreflectivity. The results, which are inconclusive and based on nonselective implementations, emphasize the need for a disaggregate analysis to see if significant effects can be detected for specific conditions. Table 1. Results of the Aggregate Analysis. Note: Bold denotes results that are statistically significant at the 95% confidence level. The negative sign indicates an increase in crashes. Table 2 presents the disaggregate analysis results, which are based on all crashes combined. The results that are statistically significant at the 95-percent confidence level are shown in bold. Note that a negative sign indicates an increase in crashes. Table 2. Results of the Disaggregate Analysis. There are opposing indications from the two States for urban/rural, with the more favorable effects for rural installations in Connecticut and urban installations in South Carolina. Based on discussions with representatives from both States, there were no discernable explanations as to why this may be the case. For both States, installations at three-legged intersections are more effective than at four-legged intersections. For minor entering AADT, there is a consistent pattern with clear indications that this strategy is more effective at lower volumes. Data were available for an analysis of other possible factors that might influence crash effects. However, no such effects could be ascertained. The other factors examined were sign size (762 mm (30 inches) versus 1,219 mm (48 inches)), presence of lighting (for Connecticut), presence of other measures such as STOP AHEAD signs, major road entering volume, and expected crash frequency prior to strategy. An economic analysis was completed to evaluate the economic feasibility of increasing the retroreflectivity of STOP signs. An estimate of the life-cycle costs of the strategy was developed and expressed as an annual cost. The crash benefits required to offset these costs were then estimated using the most recent FHWA unit crash cost data for unsignalized intersections. Based on the Office of Management and Budget suggested discount rate of 7 percent and on the expected service life (8 years), the initial costs per intersection were converted to annual costs using the standard economics formula for a capital recovery factor. Cost data provided by the two States suggest a conservatively high initial cost of about $200 per intersection, considering the mix of three-legged and four-legged intersections and sign sizes. Costs would be even lower if the marginal costs of replacing the signs were used. As of 2007, the approximate costs of Type I sheeting is $0.75 per square foot, Type II sheeting is $1.25 per square foot, and Types VII, VIII, and IX is $3.50 per square foot. Using the more conservative $200 initial installation cost translates into an annual cost of around $33 over the 8-year cycle, requiring an annual crash saving of more than $66 per intersection to achieve a benefit cost ratio of at least 2:1. The most recent FHWA mean comprehensive costs per crash for unsignalized intersections(3) are $13,238 for rear-end and $61,114 for right-angle crashes. Comprehensive crash costs represent the present value, computed at a discount rate, of all costs over the victim's expected life span that result from a crash. The major categories of costs used in the calculation of comprehensive crash costs include medical-related costs, emergency services, property damage, lost productivity, and monetized quality-adjusted life years. (3) By applying the more conservative figure of $13,238, a $66 saving would require a reduction of approximately 0.005 crashes per intersection per year. This is a reduction of approximately 0.5 percent for rural Connecticut intersections which have an annual crash frequency of 1.11 crashes per year, the lowest of the four State/environment groups. The disaggregate analysis provides further insight into the circumstances where crash reductions were identified. Installations at all three-legged intersections and three-legged urban intersections in South Carolina were found to have a statistically significant reduction in crashes. In Connecticut, a statistically significant reduction in crashes was found for three-legged rural intersections. The disaggregate analysis also shows that the strategy is more effective at lower volumes for motorists approaching the intersection along the minor road. At higher volume intersections, there are more visual cues for minor road motorists approaching a stop-controlled intersection. There are no detectable effects for nighttime crashes. As discussed previously, this might be because there are relatively few of these crashes at the study sites. It is also likely that this is because these are blanket installations, and the significant benefits at relatively few nighttime crash problem locations become diluted by the negligible effects at other locations. It should be noted that the study results do not support the degradation of signs below any desired retroreflectivity requirements. The results of this study are based on a wide-scale installation with no knowledge of the previous sign conditions. Therefore, it is difficult to determine the safety effectiveness of more highly retroreflective sheeting on STOP signs for specific conditions; there was not a large enough sample size to detect any significant effects. The sample size required to detect a significant effect would be outside the scope of this project. As indicated in the FHWA Supplemental Notice of Proposed Amendments,(4) improving sign retroreflectivity will be a benefit to all drivers, including older ones. All drivers need legible signs in order to make important decisions at key locations, such as intersections and exit ramps on high speed facilities. This is particularly true for regulatory and warning signs, where noncompliance can have severe results. A minimal reduction in crashes can be expected with the installation of higher retroreflective STOP signs. However, given the low cost of this strategy, even with conservative assumptions, only a very modest reduction in crashes is needed to justify its use. Therefore, this strategy has the potential to reduce crashes cost effectively, particularly at lower-volume intersections. 1. National Center for Statistics and Analysis of the National Highway Traffic Safety Administration. (2005). Traffic Safety Facts, National Highway Traffic Safety Administration, Washington, DC. 2. Hauer, E. (1997). Observational Before-After Studies in Road Safety: Estimating the Effect of Highway and Traffic Engineering Measures on Road Safety, Pergamon Press, Elseviser Science Ltd., Oxford, U.K.
3. Council, F., Zaloshnja, E., Miller, T., and Persaud, B. (2005). Crash Cost Estimates by Maximum Police-Reported Injury Severity Within Selected Crash Geometries, Report No. FHWA-HRT-05-051, Federal Highway Administration, McLean, VA.
4. Supplemental Notice of Proposed Amendments. (2006). p. 26,717. Federal Highway Administration, McLean, VA.